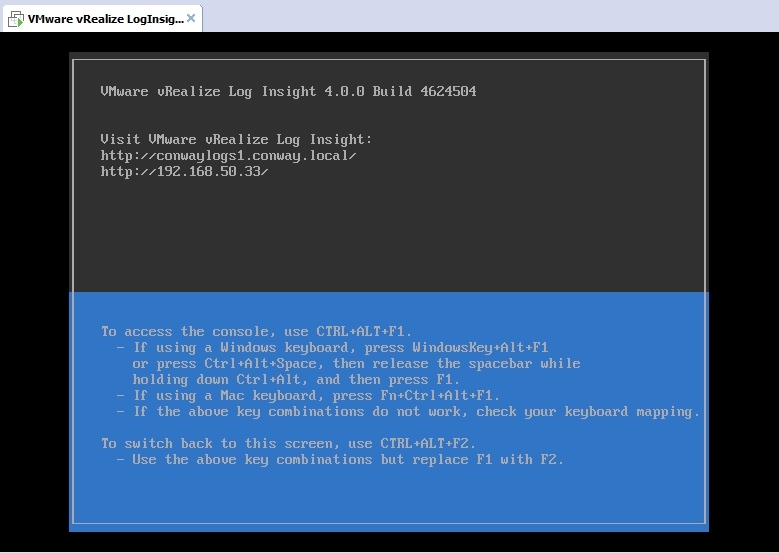 If you’ve somehow landed here after searching something related to LogInsight, then welcome to Part 2 of my LogInsight series! Feel free to check the following links to look at earlier (or later) parts of this series. If you’re following this series in order, then welcome back! 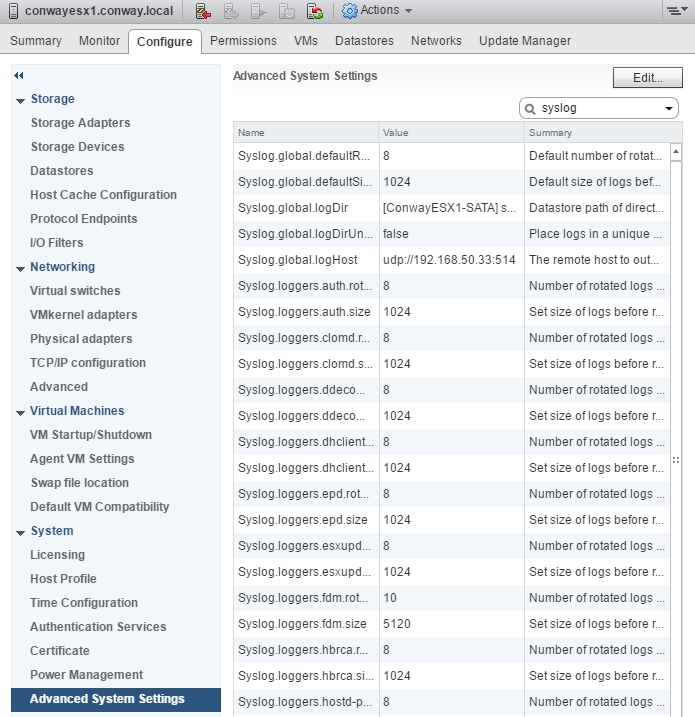 As with most vSphere solutions, VMware offers LogInsight 4 as an OVA that you deploy from within vCenter. 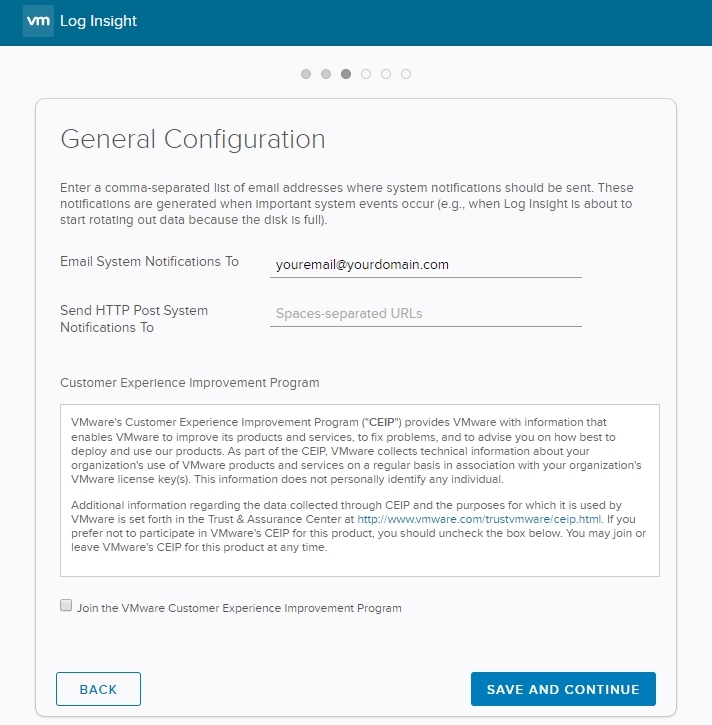 You can download the necessary files from this link, though you’ll have to log in with your VMware account. 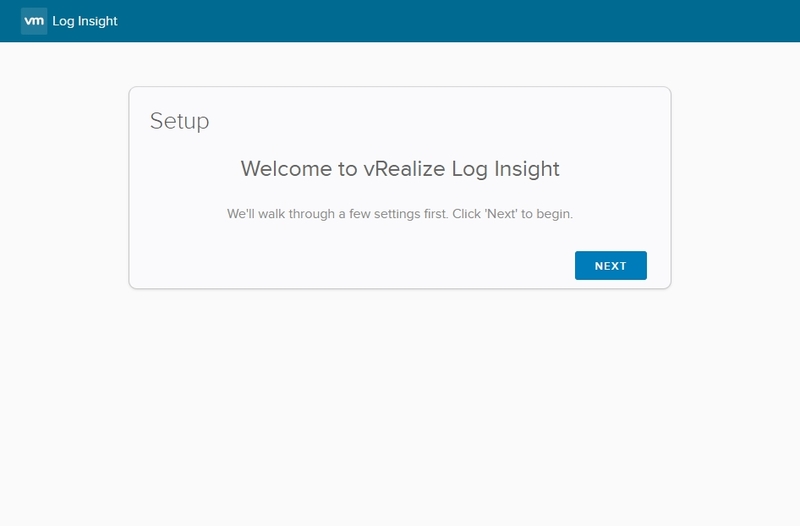 We’re interested in the download titled VMware vRealize Log Insight 4.0.0 – Virtual Appliance (vRealize LogInsight 4.3 has been released as of the date this article had been published but installation is the same for the most part). If you have your license available, enter it now – if not, you can hit skip and deal with it later. 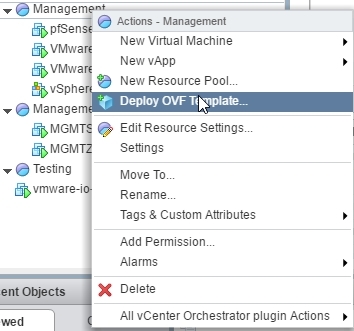 Remember, your vCenter key will allow you to monitor 25-OSIs (but restricted to the vSphere content only). You can see above I chose to opt out of the VMware Customer Experience Improvement program. Finally, you configure your SMTP Configuration settings. 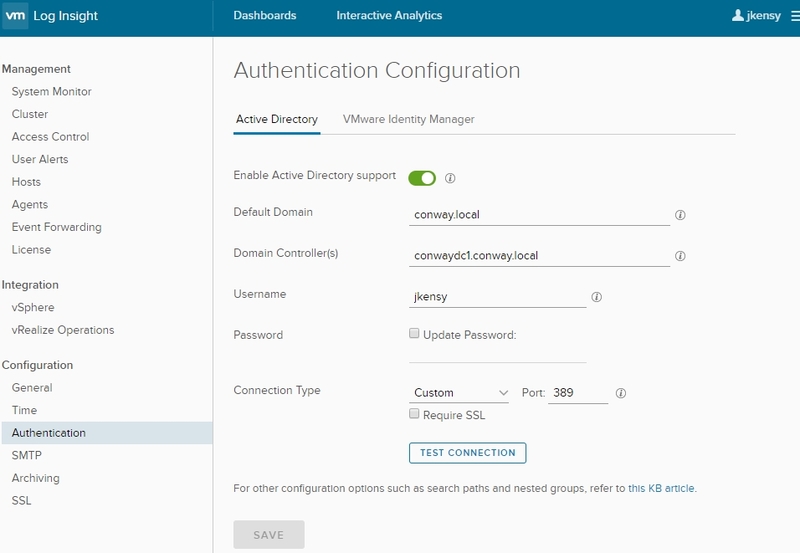 Fortunately for labbers, LogInsight allows you to configure secure relays and specify the port unlike vCenter which only alerts out port 25 with anonymous access. 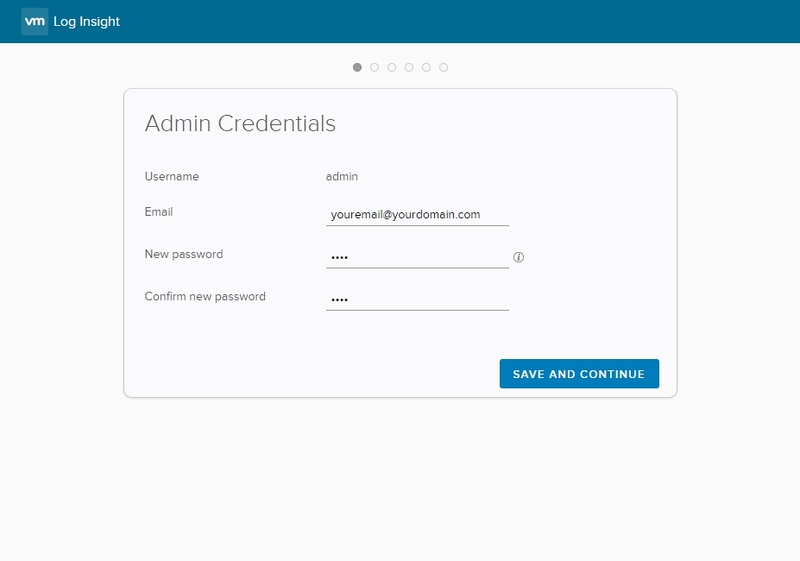 You could, then, configure LogInsight to send notifications directly through your Gmail account via SSL and everything. Ok, the UI may have lied. We’re not all done. However, if this were Graylog, Splunk, or Logarithm we’d have to start installing agents, working with grok code, creating dashboards, etc. 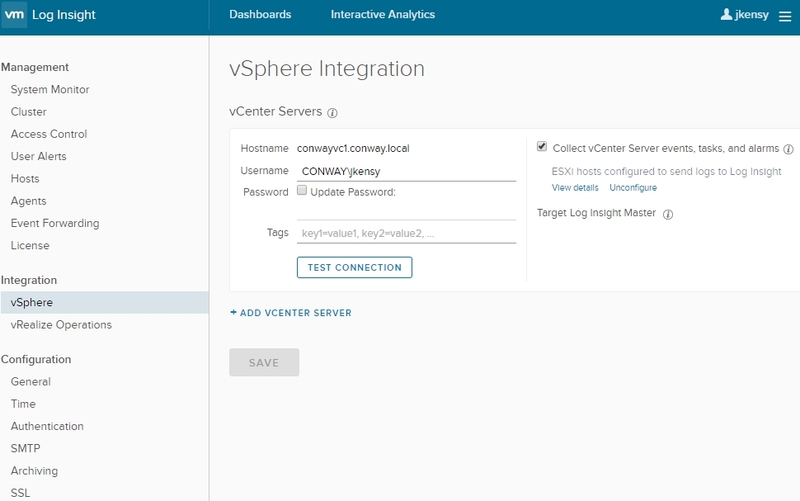 However, because this solution is geared toward consolidated monitoring of your vSphere environment you can see that there is a link for “Configure vSphere Integration“. Click that and follow on! 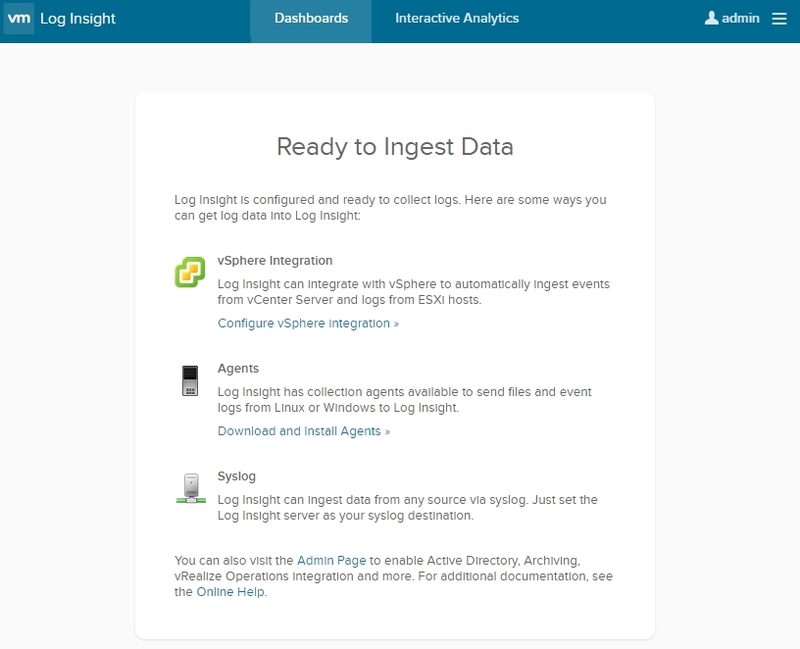 Note: If you have familiarity with LogInsight 4.0 you’ll notice that things are slightly different from this point forward. That’s because I am now capturing configuration from a fully deployed environment which was recently upgraded to LogInsight 4.3. 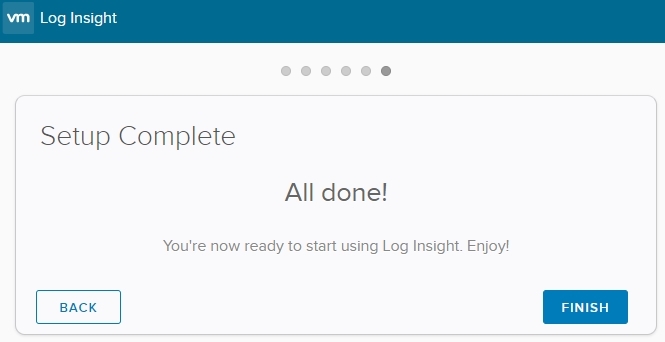 For the most part, everything is exactly the same – upgrading to LogInsight 4.3 really only addressed minor bug fixes and made some slight UI tweaks. You can read more about the changes here. 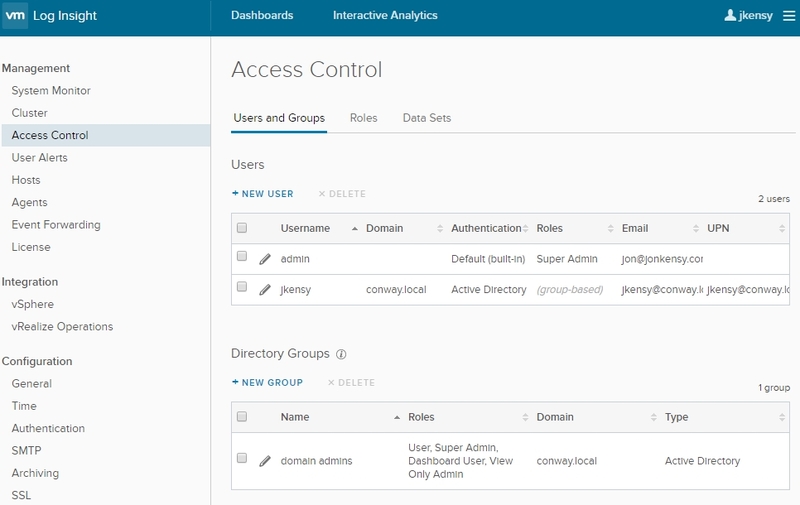 Because this is a lab environment, I do not have read-only accounts or groups configured and instead am allowing all domain admins the User, Super Admin, Dashboard User, and View Only Admin roles. Configure your environment as needed. 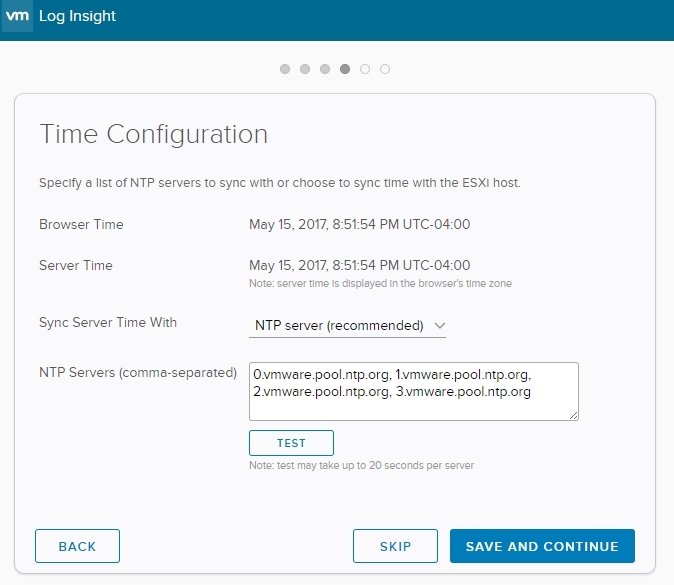 Note that it may take several minutes for LogInsight 4 to start parsing the incoming stream. 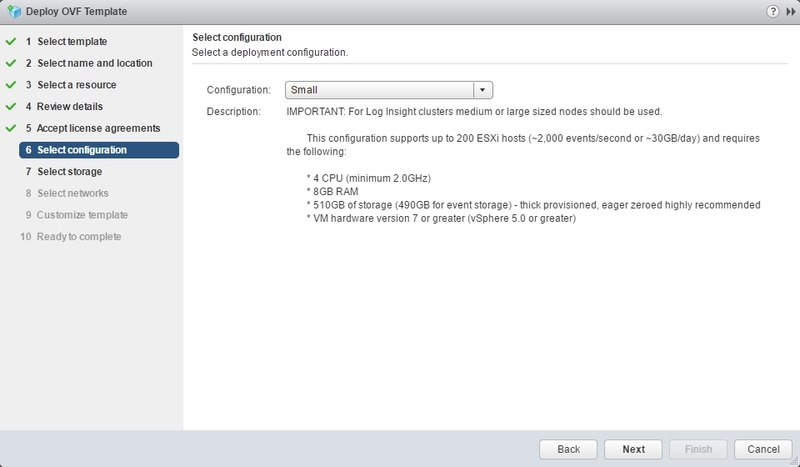 Remember, up until this point we’ve only configured ESXi hosts to send logs via the vSphere Integration configuration. 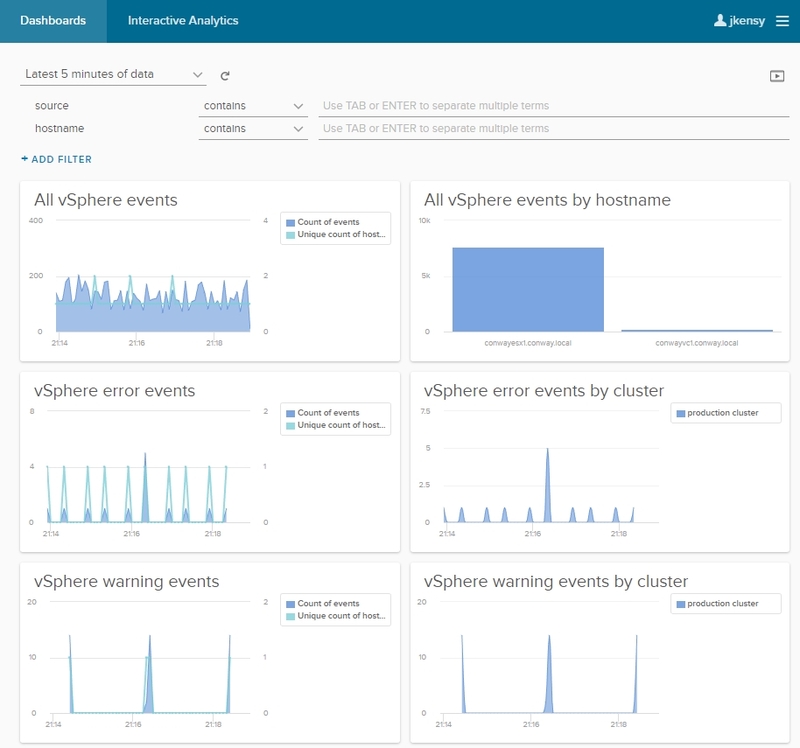 We are not receiving alerts from vCenter itself nor are we receiving any alerts from guests (Linux or Windows). That’s for another article coming up! All in all, you can see how easy it is to get this going. 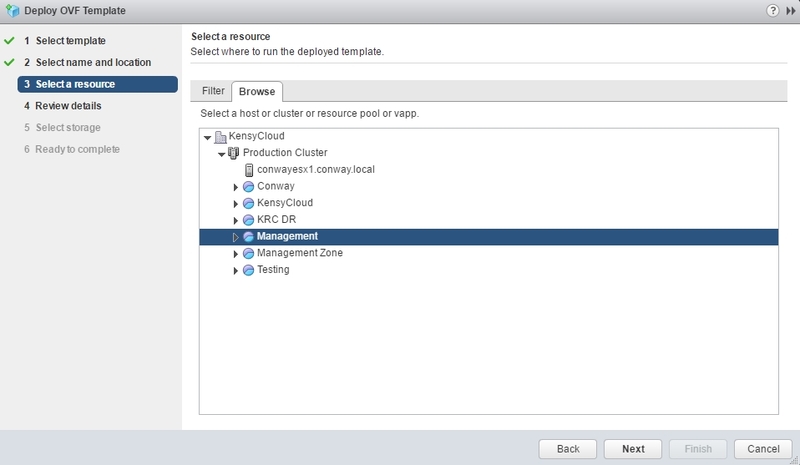 There’s no funky LDAP/S configuration to setup, no ELK stacks to deploy, and no fuss overall. If you are having any issues getting logs from your ESXi servers at this point please refer to the first part of this series for topology/network considerations. 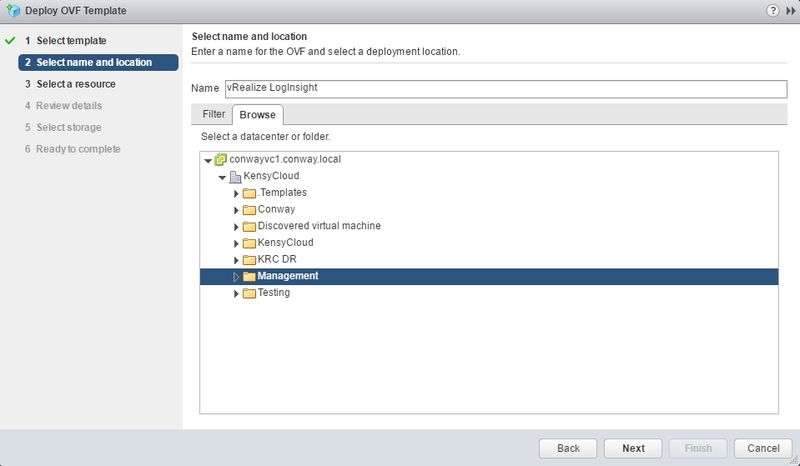 By default ESXi will be configured to send over UDP 514. Thanks as always for reading and stay tuned for the next part in this series where we install and configure agents! Don’t forget to read the rest of the series by following the links below!